Greggs has officially launched its new ‘Greggs Rewards’ mobile payment app, designed to reward its customers for their loyalty while making shopping across its 1,700 shops more convenient, quicker and easier. The new rewards app went live nationally late last week and is the first entirely digital loyalty scheme launched by a UK convenience food retailer that eliminates the need for customers to carry a separate loyalty card or cash in their wallet when they shop. Customers can register for a Greggs Rewards account via the app or online at www.greggs.co.uk. They can then top up their accounts with any amount from £5-£50 using their debit or credit card, or without entering card details via PayPal. Once topped up, the app will allow them to pay securely instore with their smartphone. Greggs Rewards will not only allow customers to pay swiftly for their purchases, but it will also reward them with exclusive treats and rewards built into the app. These offers include a free Greggs’ breakfast when opening an account with at least £20, hot drink incentives (e.g. buy seven coffees get your next free), a birthday treat and a monthly prize draw for the chance to win an iPad when shopping using Greggs Rewards. PayPal is also giving its first 10,000 Greggs Rewards customers a free £5 bonus credit to spend when they sign up and register for auto-top up with PayPal. 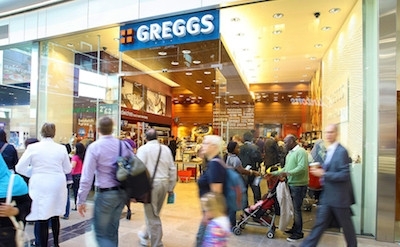 Greggs Rewards has been developed using digital transaction network services from Eagle Eye, which are designed to enable retailers to connect with potential and existing customers in real time. The network can be used to deliver relevant offers, rewards and services that can be redeemed securely through any point of sale. The digital system also removes the need for paper vouchers or plastic cards, simplifying the checkout experience and helping to eliminate paper-based vouched fraud. The retailer and loyalty expert worked with digital agency STEEL London, which supported Greggs in developing the concept, and PayPal for some of the payments integration. Roger Whiteside, Greggs chief executive, stated: “We are really excited to announce the launch of Greggs Rewards across the UK. We’ve spent a lot of time talking to and listening to our customers and have found through extensive consumer testing in the run up to the launch, that a simple but rewarding scheme is something that they want to fit with their on-the-go lifestyles.